I cannot recall the number of bosses I have had in the past, but certainly the number was big. Some of them were great while others have helped me build and shape my career. The good part about having a boss is that they are always there to guide and support you. From pointing out your mistakes to advising you on various matters, bosses are always the best. 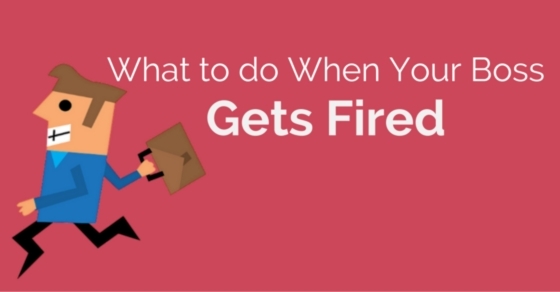 But what happens when your boss suddenly gets fired or resigns? Of course this will be followed by negative repercussions. Your performance level could really go down because of this. So what should you do? Over the years I have seen several reactions but there are some steps you can follow as precautions. Here is a quick list on that! What to do When Your Boss gets Sacked? From my experiences, I can tell you it can get very difficult to let go of your bosses. My immediate reaction was excessive panicking. I thought that since my boss isn’t there anymore, I will not be able to do as well as I used to. Plus the thought of getting kicked out was also a fear that took over my mind. The first couple of days after I heard about his leave, I was stressed and anxious. As a result of this I ended up making a huge mistake. So there is one lesson you can pick from this. Why your boss was made to leave had nothing to do with you. And even if it did, you would have been fired too. Yes, it can be so that the firing your boss could serve as a bad omen for things to happen. But even if that is happening, make sure your company members are not viewing you as some kind of nervous wreck. And if it does seem like an isolated incident, you worrying about damaging your reputation cannot be spoken about to your new boss. Once you feel calm and relaxed, the next thing you must remember to do is make your presence obvious to others. Bosses can at times serve as a buffer between the teams they have ruled and the senior management. This happens mostly in bigger companies. So there is a chance that the well known ones will not understand what you are doing or it could so happen that they wont even know who you are. And this is where you need to bring the change. People will be taking a close look at your team so make sure the change is smooth and slow. This will give you the chance to steal some limelight and let the senior managers know how important you are to the company. You should make good presentations and arrive early to work. Show how positive you are as a person. That will make a difference. Now this technique can definitely be implemented if your boss has been fired. If you want the powers to notice your hard work and effort, you must step it up. Help your team at the same time make adjustments. Fight for your spot to stay. To make this happen you must reach office early and leave as late as you can. Now I don’t mean you should work 60 hours a week. What you should do is make sure you have extra work to finish by the end of the day and will leave only when that is complete. Leave, after others have left and keep yourself busy. You might not be doing a great deed here but at least your seniors will know how well deserving you are of this spot. Remember, this is the time when all your seniors are going to take a closer look at you. So when you have found yourself in a spot where people are gossiping, especially about the former boss, make sure to leave instantly and excuse yourself. Even if you aren’t gossiping with them, a passerby could think you are guilty like the rest by just sitting there. Instead you should stay positive and continue working. There is no need for you to go overboard. You will see many of your bosses come and leave over the years and it can never be too easy to watch one of them leave even if it is something they don’t want. But how you can handle yourself will speak a lot about you and your level of professionalism. What to do When Your Boss Resigns? Once when my favourite boss left his seat, I was upset and took it rather personally. We had worked together for years and our relationship was strong. Plus she was a great mentor. The minute I found out she was leaving, I was so upset. I was selfish and kept wondering how could this person do this to me? And there were times when I was alone and so depressed. Seeing my boss move on made my job more complicated. And that is where I went wrong. When your boss leaves, please know that it has nothing to do with them. They did what they could have done and now it is time for them to leave. You can always share your supports with them and suggest the idea of keeping in touch. You can actually create a positive impression in front of your ex boss through this. They will be amazed seeing your appreciation and will surely remember you in the long run. Some investigation will also help you in cases like this. You should ask the members of your office but don’t make it too obvious. Plus when you are asking, make sure it is just the senior level members. Show how concerned you are for your boss and that you want them to have a great future. Then you should casually ask about this whereabouts. Your seniors can surely give you a lot of information about this matter. Even though there is hardly any guarantee, you can still gather some knowledge if not a lot. You could also plan a farewell party for them and hopefully contact him soon enough. Now this technique should be applied if you really miss your boss and go where they are. If you don’t, then skip this one. An exit strategy will help you land the job you want to. It will bring you nearer to your ex boss. For this you will have to start circulating your resume. This is also the time when you should assess yourself. Perhaps you really adore your ex boss because of how much they have helped you with work and recent assignments. This is your chance to make the decision whether you want to stay in the industry or move on. That will help you determine whether you can send your resume around. However, before you plan an exit, you should not make any rash moves because the first few weeks are always tough for the manager. Plus your old boss was removed for some reason. So be mindful of that! Assessment is also highly important. When you boss leaves the organization, there are other employees who should assess the person who is currently stepping into management. Everything should be examined about your new boss very fairly and critically. You must determine if the new manager is capable of handling the work load. A good boss is someone who can handle work like a professional and will not even remind you of your old boss. So make sure to play attention to their results. Also you should note about how the new boss is making you and your colleagues feel. Job satisfaction is very important in giving you happiness. And if you aren’t receiving them, then its high time you assess the employment situation and speak to your seniors about it. Yes! Your boss is the lynchpin of your work experience. A great manager is one who can make the most difficult work tolerable. When they leave we often feel like we can’t go on any further. But that is certainly not the case. If you have lost your boss recently, make sure to use all these ideas. Hopefully you will not be as left out as before. Plus we would love to hear some feedback about this post! In case there are questions you have in mind, ask us too. We will try our best to answer all of them. On that note, good luck.